UCLA professor of Public Policy Mark Kleiman — who is helping the state of Washington set up its legal cannabis industry — will speak Wednesday. June 26 at the Valley Center for the Performing Arts, 3500 Mountain Blvd, Oakland as part of Councilmember Libby Schaaf's Safe Oakland Speaker Series. Professor Kleiman will talk from 7 to 9 p.m. about how clear rules and credible sanctions could control crime without crowding prisons. 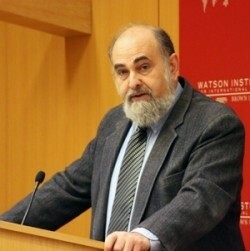 Kleiman is the author of When Brute Force Fails: How to Have Less Crime and Less Punishment and is an expert on crime control policy. Kleiman also co-authored the 2012 book Marijuana Legalization: What Everyone Needs to Know, with the RAND Drug Policy Research Center. In 2013, the state of Washington tapped his policy consulting firm BOTEC to advise the Liquor Control Board on draft regulations for a legal cannabis industry in the state. Kleiman has been a voice of reason amid the hype around Washington. He recently explained that former Microsoft exec Jamen Shively — who wants to start a national weed brand, Diego Pelicer, with ex-Mexico president Vicente Fox — was an "insensate greedhead" who would most certainly go to federal prison if he tried to grow the stuff. However, there is a lot of money to be made selling potentially worthless securities in cannabis startups. A livestream of the event will be available here as well as a recording of the lecture here.